Bronwyn has over 30 years in mental health, and more recently, alcohol and other drug services. Prior to joining Directions in 2013, Bronwyn was the Director Mental Health in the Northern Territory for 11 years, directly responsible for mental health policy, public mental health services and funding of non-government mental health services. In her clinical roles she specialised in emergency psychiatry and her senior management roles have included Manager Top End Mental Health Service in the Northern Territory and Manager Country Mental Health in South Australia. She has extensive experience delivering services in urban, regional and remote areas, working in partnership with service providers and communities to develop innovative programs that better meet the needs of Aboriginal people and other vulnerable populations. 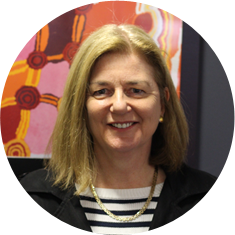 She has a Diploma in Mental Health Nursing, Bachelor of Arts from UWA, has undertaken relevant studies at post graduate level and is a graduate member of the Australian Institute of Company Directors.